Text4baby is a data-driven initiative. Staff routinely monitor and analyze a wide array of data collected by the program, including data on enrollment, completion and cancellation, participant-reported reason for cancellation, referral source, and descriptive data from various surveys sent through the mobile platform. Data are reviewed to inform and improve program promotional, outreach, and product strategies. Additionally, Text4baby provides partners with access to real-time enrollment data to support them in understanding the impact of outreach initiatives on enrollment. Below are some key findings from Text4baby’s ongoing research and evaluation efforts. Participants enroll early in their pregnancy: Over 38% of participants who signed up to receive pregnancy messages enrolled during the first trimester. 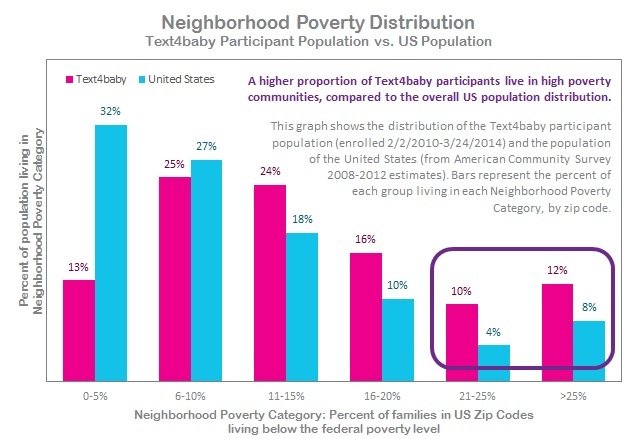 Participants live in high-poverty areas: A higher percentage of Text4baby participants live in zip codes with the highest levels of poverty compared to the overall U.S. distribution. Click here to view a graph representing these findings. Participants are from low-income households: Over half (52%) of respondents to a national survey of Text4baby participants implemented by the California State University San Marcos National Latino Research Center (CSUSM) reported their household income was $16,000 or less. 99% of Text4baby participants in a Health Services and Resource Administration (HRSA) funded evaluation said they would recommend the service to a friend or family member, 90% read the messages and found them easy to understand, and 64% thought the messages were useful. 99% of WIC participants in an Emory University study had no concerns about enrolling in Text4baby; 95% reported the enrollment process was easy; 92% regularly read Text4baby messages; and 88% planned to continue to use Text4baby. 92% of Text4baby participants who responded to a text-based survey since launch said they would refer Text4baby to a friend and rated the helpfulness of the service as a 7.7 out of 10.
than the comparison groups (81% of Text4baby participants responded correctly vs. 60-62% of other prenatal participants). Participants are prepared: A George Washington (GW) University-led randomized study found Text4baby mothers were nearly 3X more likely to believe that they were prepared to be new mothers compared to those in the control group. Participants have improved beliefs: Findings from an RCT funded by the DOD Telemedicine and Advanced Technology Research Center and lead by GW and the Madigan Army Medical Center found improvements in beliefs targeted by Text4baby, including (1) the importance of prenatal care, (2) the risk of alcohol use, and (3) the importance of prenatal vitamins, among participants with short term (4 week) exposure to Text4baby compared to the control group. Participants talk with their providers: 65% of CSUSM participants reported they talked to their doctor about a topic they read on a Text4baby message. Participants access health services: 47% of CSUSM participants reported Text4baby helped connect them to health services for them and/or their baby, with a higher percentage of uninsured participants (60%) reporting that Text4baby helped them access health services. Participants utilize hotlines and websites: 77% of CSUSM participants reported they opened a Text4baby link, and 46% reported they called a referral number they received from Text4baby. More than half (53%) of Text4baby participants in the HRSA-funded evaluation reported they saved referral numbers for future use. Participants remember appointments: 63% of CSUSM participants reported Text4baby helped them remember an appointment. Participants have improved glycemic control: Preliminary results from a study conducted by St. Louis University researchers show a significant difference in average glucose values within goal between the Text4baby control group and the no-text control group (73% vs 20%, N=30). Recruitment for the study is ongoing. Participants report lower postpartum alcohol consumption: 60% of Text4baby participants in the DOD-funded RCT reported no alcohol consumption at follow-up versus 40% of control participants.7 Additionally, high-dose Text4baby participants in the DOD-funded RCT were more than 2X as likely to report they abstained from drinking at postpartum follow-up compared to low-dose participants. Well-baby Visit and Childhood Vaccination Pilot Project: Text4baby worked with the California Department of Health and Immunize Nevada to implement a well-baby visit and childhood vaccination module in March 2013. The goal of the project was to gain insight on self-reported well-baby visit attendance and childhood vaccination status among participants. Preliminary results show higher self-reported appointment attendance among participants who received education and appointment reminders compared to those who did not receive them, and high rates of self-reported hepatitis B vaccination. Encouraging Medicaid and CHIP Enrollment: In partnership with the Centers for Medicare and Medicaid Services, Text4baby implemented an interactive of module of messages to identify the health insurance status of Text4baby participants and provide information on Medicaid/CHIP eligibility/enrollment to uninsured participants. Preliminary results suggest messaging sent to uninsured women may encourage Medicaid/CHIP application among pregnant and new mother Text4baby participants. Additionally, the Kaiser Family Foundation (KFF) conducted interviews with Text4baby participants to better understand the impact of the Medicaid Module. Findings are highlighted in their February 2014 Issue Brief. Encouraging Influenza Vaccination: In October 2012, Text4baby implemented an interactive module of messages encouraging influenza vaccination to gain insight around whether appointment reminders and tailored education improve self-reported vaccination coverage among participants. Preliminary results were presented at the 2013 mHealth Summit. Text4baby also collaborated with the Centers for Disease Control and Prevention to incorporate Text4baby questions into an existing surveillance effort to compare influenza vaccination coverage for pregnant Text4baby participants to non-participants (in progress). Encouraging Smoking Cessation for Pregnant Women: Text4baby is collaborating with GW to assess the feasibility and efficacy of a smoking cessation text messaging program (Quit4baby) for pregnant smokers. Results from the feasibility study found participants reported that the program was helpful in quitting, that the program gave good ideas on quitting, and that they would recommend the program to a friend. The next phase of the project will test the efficacy of Quit4baby in a population of 500 Text4baby pregnant smokers (in progress). Feasibility of Text-Based Developmental Screening: Text4baby collaborated with GW, the State of Maryland, and Prince George’s County Infant and Toddlers and WIC programs to assess the feasibility of text-based developmental screening and inform a scalable model. Results will be shared soon. Text4baby Receptivity and Theory Evaluation: Text4baby is collaborating with the University of Maryland School of Public Health, Herschel S. Horowitz Center for Health Literacy on two separate evaluation efforts, including (1) a small pilot to assess receptivity to Text4baby messages and knowledge, awareness, and behavioral outcomes among Text4baby participants and non-participants; and (2) an analysis of Text4baby messages based on health communication and health behavior theory in an effort to identify how Text4baby messages align with theories (in progress). Informing Future Physical Activity Messaging: Text4baby is collaborating with Arizona State University on a study to inform the development of effective physical activity messaging during pregnancy. The study tracked physical activity (using a Fitbit) among pregnant women randomized to four text interventions, including standard Text4baby messages. Results will be shared soon. Click here for a factsheet summarizing Text4baby's impact. Click here for a factsheet summarizing Text4baby's impact among Spanish Language Participants. Click here to view national and state-level Text4baby enrollment data. 1. Complete MOU found here. 2. During your intake call with ZTT staff, you will be informed about next steps for data access, which will include completing a Data Use Agreement. 3. Once the DUA is completed, ZTT staff will work with Voxiva to create log-in credentials to give you access to real-time, zip-based enrollment data in your state. 4. ZTT hosts bi-monthly webinars to train you on how to access and use the enrollment database. A staff member will contact you regarding training.